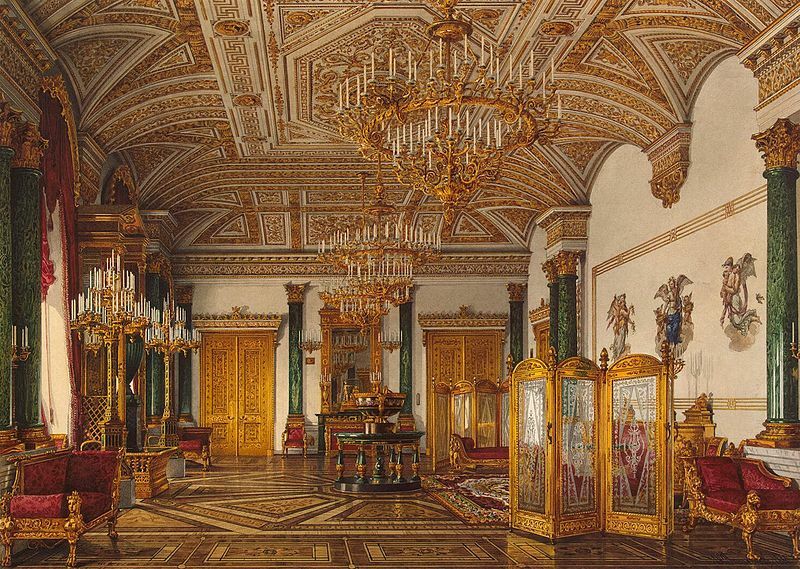 Once upon a time, long ago and worlds apart, the Winter Palace was the crowning jewel among all the palaces of Tsarist Russia. This massive edifice was the Imperial Family’s official residence, and the location of court during “the season,” October–March. All of high society and the Imperial Court would turn out for lavish, decadent, extravagant parties, balls, and other society functions. Sadly, after the October Revolution of 1917, the Reds ransacked this beautiful seat of splendour. Priceless artwork, crystal, china, books, furniture, pictures, everything was destroyed or looted. 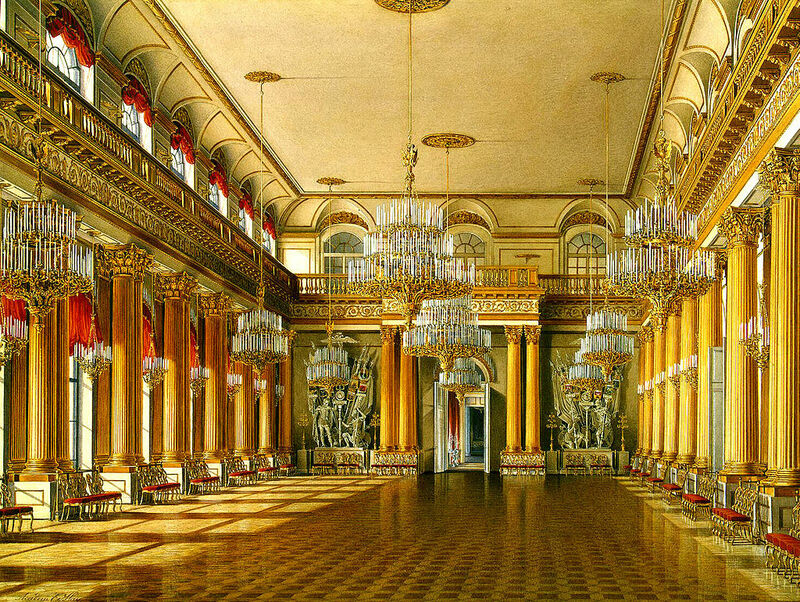 The Winter Palace went through several incarnations, with the first built from 1711–12 for Peter the Great. He eventually bored of this small, humble abode, and the second Winter Palace was built in 1721. 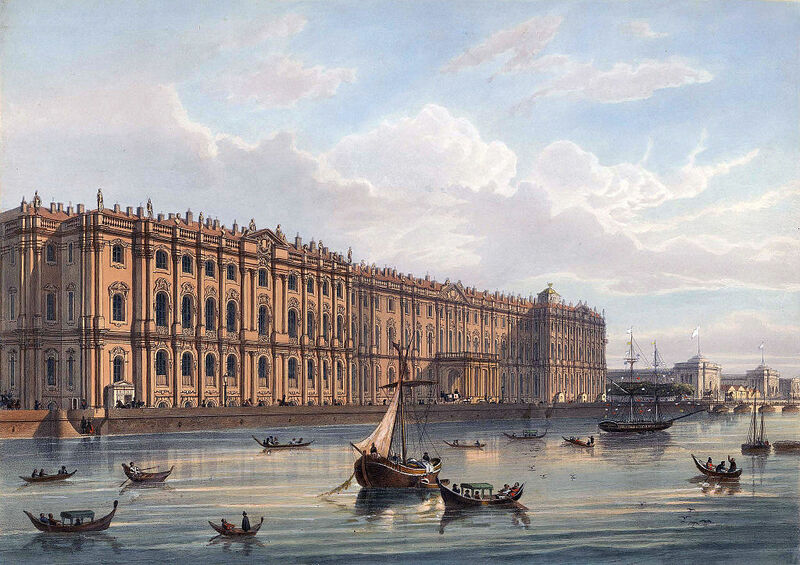 The third Winter Palace was finished in 1727, under the reign of the unmemorable Peter II. 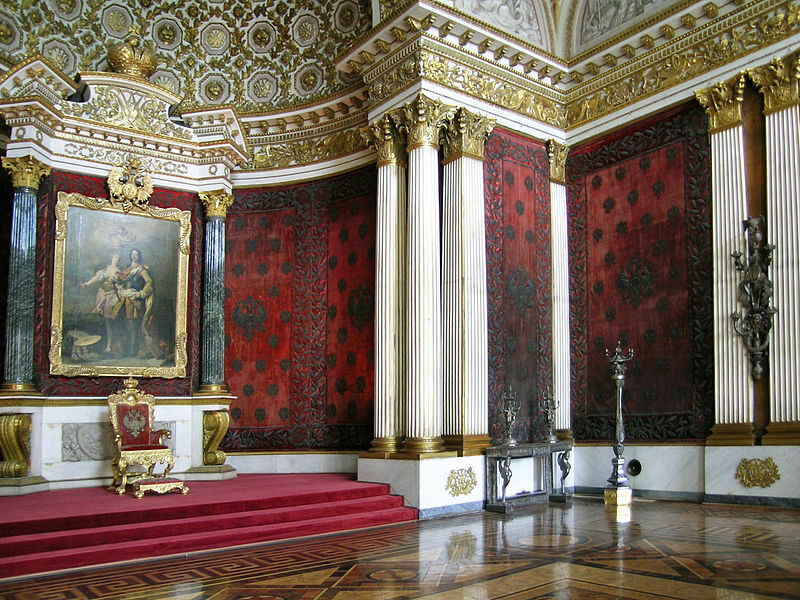 In 1730, under the reign of Empress Anna, the Imperial court was re-established at the Winter Palace. However, she didn’t care for the existing palace, and so commissioned a fourth Winter Palace in 1732. Construction continued under the reign of Empress Yelizaveta, and that final product became today’s Winter Palace. This immense triumph of Imperial power has 1,500 rooms, 117 stairwells, 1,786 doors, and 1,945 windows. In Tsarist days, it was painted red, but today it’s been repainted white and jade green. It takes up prime real estate between Palace Square and the Palace Embankment, along the majestic Neva River. A massive fire broke out in 1837, and the palace was almost immediately rebuilt. The ground floor contained mostly bureaucratic and domestic offices; the first floor (in the western wing) was for the Imperial Family; and the second floor was for high-ranking officials and senior courtiers. The eastern and northern wings were for state rooms. The palace’s four corners contained rooms for lesser members of the Imperial Family. 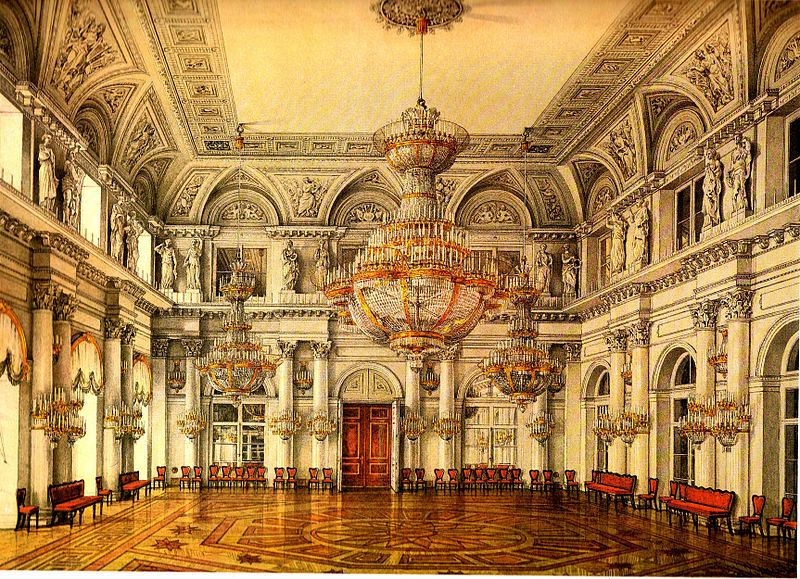 The Winter Palace boasts stunning examples of architecture, beauty, splendour, and decoration including the Jordan Staircase, Malachite Room, Arabian Room, Gold Drawing Room, Great Throne Room (St. George’s Hall), Concert Hall, Nikolay Hall, Great Antechamber, Armorial Hall, Grand Cathedral, Field Marshals’ Hall (where the 1837 fire began), Small Throne Room, Military Gallery, White Hall, Rotunda, Aleksandr Hall (new after 1837), and Apollo Room. 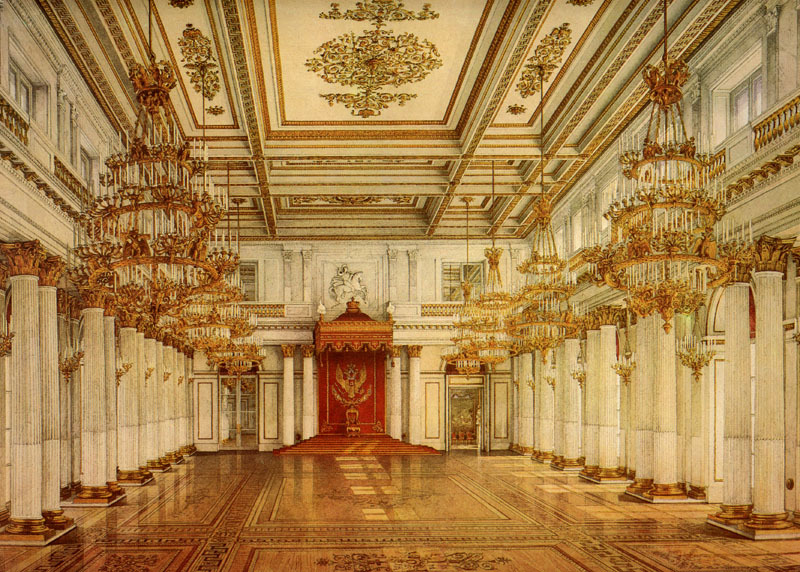 The Great Throne Room was the site of the First Duma’s opening in 1906, the first time commoners had been inside the palace en masse. The members of the Imperial Family in attendance thought they saw hatred in the Duma’s eyes, and couldn’t understand it. The Imperial Family were staggeringly, mind-boggingly out of touch with how the masses of ordinary Russians lived, and insisted on upholding a severely outdated autocracy and ridiculously draconian house laws even in the face of their own relatives rebelling. So many things should’ve been done differently to prevent the Revolution. 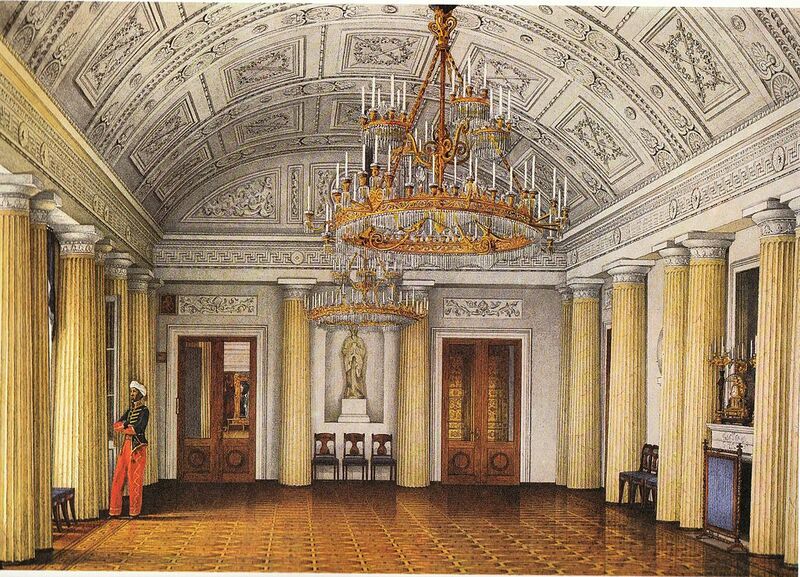 Though the Winter Palace was the official home of the sovereign and his or her family from 1732 onwards, the last Tsar who really used it as his home was Aleksandr II. After his assassination in March 1881 (on the eve of his granting a constitution), it was judged to be too unsafe for the Imperial Family. Aleksandr III (an extreme reactionary whom I hate as a Tsar but like as a family man) moved his family to Gatchina Palace. Nicholas II (whom I also hate as a Tsar but like as a person) chose the Aleksandr Palace as his family’s primary residence. The last hurrah for the Winter Palace was a February 1903 17th century costume ball, in which Nicholas and Aleksandra dressed as Tsar Aleksey the Meek (another Tsar I hate) and his first wife, Mariya Ilyinichna Miloslavskaya. The photograph of the decadent celebrants in the Hermitage’s theatre was the final photograph of the entire Imperial Family together. Following Bloody Sunday in January 1905, the Imperial Family used the Winter Palace even more rarely than they already did. In 1914, war was declared from the balcony, and the palace was turned into a hospital for the war wounded, rechristened the Tsesarevich Aleksey Nikolayevich Hospital. In my alternative history, the Winter Palace is used as the Imperial Family’s home during part of the winter, and for celebrations like weddings, but isn’t restored as the official residence. In 1944, during the rescue of Hungarian Jewry, all the palaces are used to house the refugees. Such a massive place. I hope they use it for something worthwhile now. Wow. Such extravagance. No wonder the people were angry. Wonderful photos! This is the second Winter Palace post I’ve read today – the other was by Zeljka Dekic, The Truck Traveller. 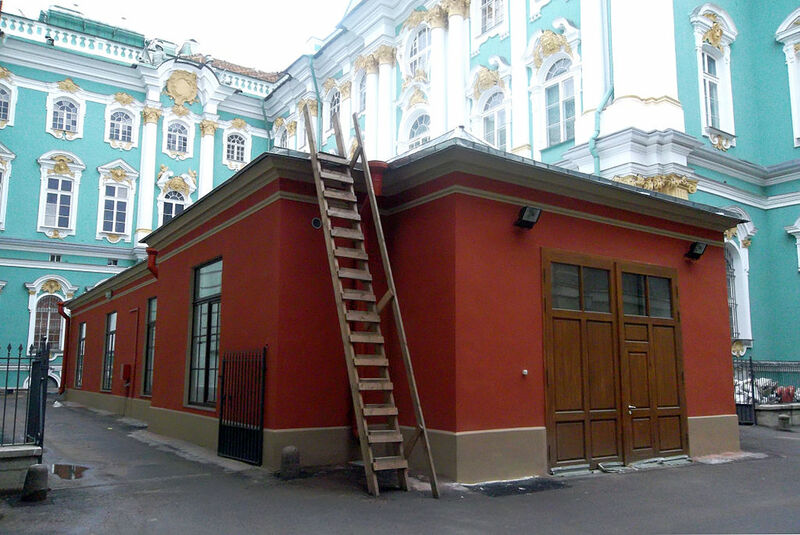 I visited St Petersburg many years ago and went to the Hermitage – and it was fabulous. Wonder how they kept those huge rooms warm. It’s no wonder the Tsars such a different world view. They didn’t have a clue about the peasants’ condition. How could they with these walls surrounding them daily? What beautiful rooms. 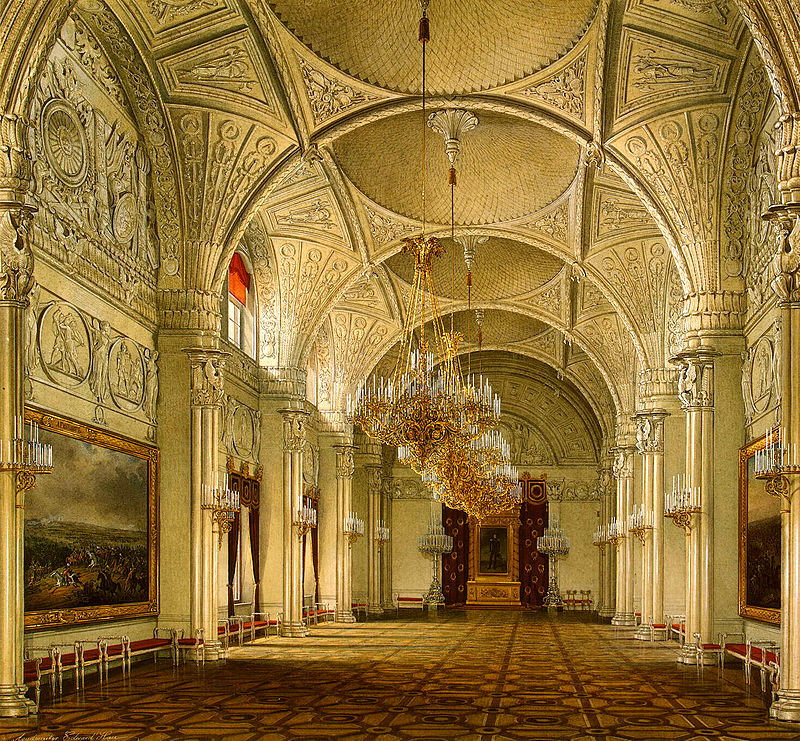 I had heard of the Winter Palace, but I had no idea there were so many different versions of it. It’s such a shame that so much was destroyed during the revolution. 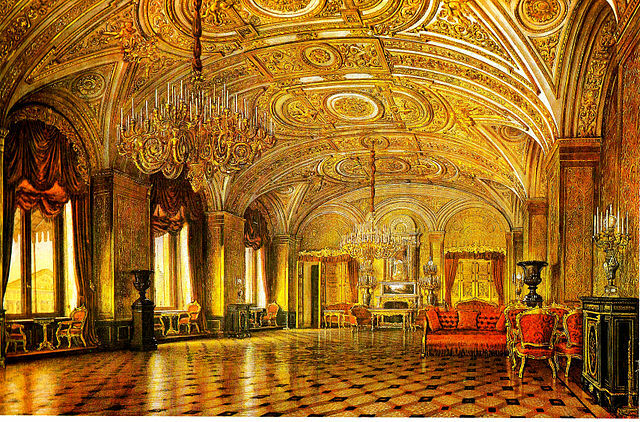 Thanks for sharing such an enriched Winter Palace history! =) it looks incredible. Love the name of your blog! I know that you always think, some people were enjoying (or even not enjoying, as the case was) this while a lot other people were starving. But I always think that there is true craftmanship here too, and that deserves o be celebrated.